HTC’s 4.3-inch behemoth proves bigger really is better – until you weave Windows Mobile 6.5 into the mix. 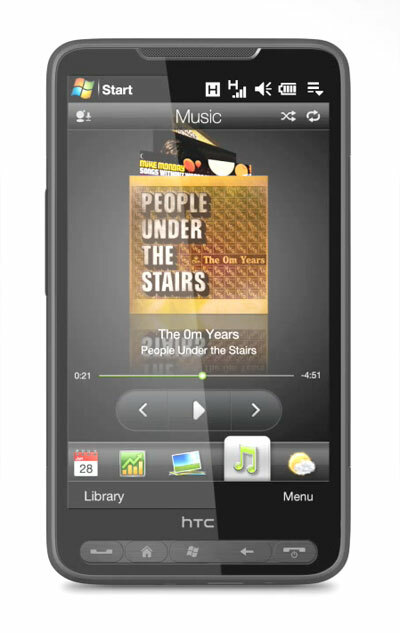 HTC’s HD2 from T-Mobile, with its glossy 4.3-inch display and Blockbuster download capability, is about as close to a personal multimedia device as a cell phone can get. Too bad it has the wrong operating system: the nearly obsolete Windows Mobile 6.5 Professional sugar-coated with HTC’s Sense. Yes, the HD2 is chockfull of lovely technologies, but can all its wonderful multimedia capabilities peacefully co-exist in a heretofore touchscreen unfriendly operating system? The HD2’s charcoal gray metal casing looks and feels more elegantly professional and just as sleek as the iPhone, but it also gives the phone a bit more heft – 5.54 ounces, which can embarrassingly sag a dress shirt’s breast pocket. It’s also devoid of perimeter buttons. There are five familiar controls – send, home, Start, back and end – beneath the 4.3-inch, 480 x 800 capacitive touchscreen, and only a nearly flush volume toggle on the left spine. The HD2’s 4.3-inch glossy screen is beautiful, although in certain ambient light situations the sensor array dots become visible. Inside, you’ll find Windows Mobile 6.5 Professional, inadequate and overblown when it first came out, and likely already on its way out, if Microsoft’s Kin phones and the varying Windows Mobile 7 previews we’ve seen are any clue. HTC has sensibly overlaid WM6.5 with its Sense OS, which greatly smoothes over WM’s myriad annoyances. But why use two operating systems when one (Android) would have done the trick? Other than this double OS, HD2 is a cornucopia of multimedia fun: Windows Media Player and an FM radio, both an Opera Mini and IE browser, connection to T-Mobile’s growing 7.2 Mbps 3G network, a 5-megapixel camera with dual-LED flash, default high-quality YouTube videos, all powered by a 1GHz Snapdragon processor. Most innovative is the Netflix-like Blockbuster application, from which you can rent or permanently download full-length movies. What’s not inside is memory – only 448 MB of RAM and 512 MB ROM as listed. Yet our test unit told us we had 690 MB of memory. That’s not a bad thing, just curious. However, the phone comes with a 16GB microSD card pre-installed. 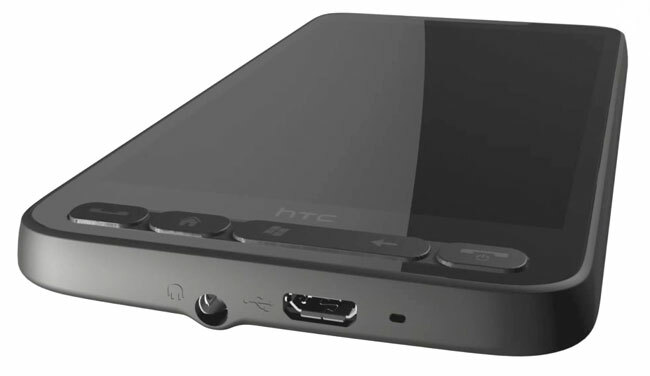 Only two ports dot the outside of the HD2: the microUSB connector and the 3.5mm headphone jack. Both are located side-by-side at the bottom of the phone, leaving the rest of the perimeter unmarred. The HD2 boasts both an excellent MP3 player and an FM radio for music, its raison d’être is video, with the Blockbuster app in the starring role. Once we managed to crawl through the labyrinthine signup, we were able to download Clint Eastwood’s 134-minute Invictus in 13 minutes, while Guy Ritchie’s 128-minute Sherlock Holmes filed in at 25 minutes, both over Wi-Fi. You can’t use T-Mobile’s network to download movies, and you’d best plug the HD2 into AC – one download drained around half the remaining power. Slower-moving character studies are easier to watch, but even on this phone’s big screen, quick-cut action movies like Transformers are hard to follow. The bigger problem is that the app infuriatingly doesn’t remember where you stopped watching; once you exit the movie app, the film starts from the beginning, and it’s ridiculously difficult to find the exact spot where you left off. Not even Sense can save the app from Windows Mobile’s mindless meddling. While trying to pick up from where we left off in our fully legal paid download of Invictus, we were told we had to acquire a Windows Media license to watch it, despite already legally watching the first two-thirds of the film. We were then sent to a Web page to sign into – wait for it – CinemaNow, even though we had rented the film from Blockbuster. (Yes, we know Blockbuster bought CinemaNow, but who cares – we rented the film from Blockbuster, and everything ought to be labeled Blockbuster.) CinemaNow, however, didn’t like our Blockbuster user name and password. We couldn’t finish watching Invictus, and have no idea where to go for a refund – Microsoft, HTC, Blockbuster, CinemaNow? People may complain about Apple’s closed iPhone ecosystem, but at least one knows where to go to get relief. Like many large LCDs, the HD2’s display is highly reflective, which can detract from video viewing. But considering the aforementioned issues, this high reflectivity is the least of HD2’s OS and movie app troubles.